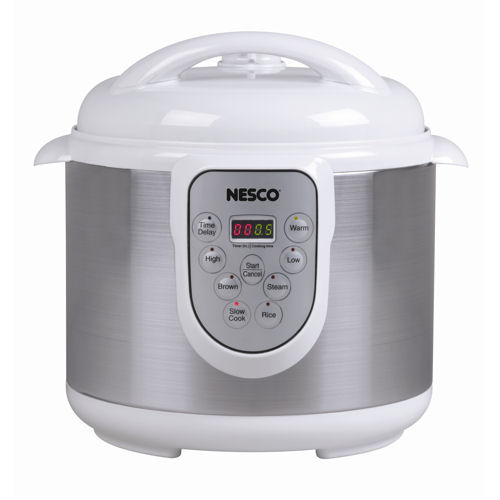 The Nesco PC6-14 Pressure Cooker is a 4-in-1 multi-purpose pot that can stand in as a pressure cooker, steamer, slow cooker and rice cooker. There is a removable hinged lid with automatic pressure release and has a LED display with soft-touch buttons. The programmable electric cooker comes with preset functions which can provide up to eight hours of delay. The Cooker features brushed stainless steel exterior and has warm settings that can be manually used or will automatically switch to warm after using a high or low setting non-stick cooking insert are removable for easy clean-up. It has a removable cord for easy storage. The Nesco PC6-14 has many exciting features for users of all types. You can extend the lifetime of your Nesco PC6-14 with the purchase of a FactoryOutletStore Factory Protection Plan. 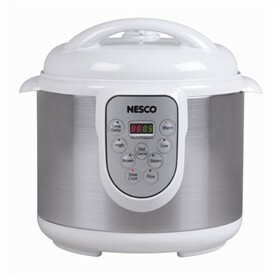 See the Nesco PC6-14 gallery images above for more product views. The Nesco PC6-14 is sold as a Brand New Unopened Item.